A lot of our customers -- especially at this time of year -- are brides, grooms, parents of the bride or groom and wedding planners getting ready for an upcoming wedding. Today we received an inquiry from a bride-to-be in London whose wedding is still many months away, but she began to give some thought about what to use as the chuppah. She sent the following inquiry. Hi, I am looking for an all white Tallis to form the canopy for the chuppah at my wedding. What is the biggest size that you do? What are the dimensions? I am looking for matte white and no fringes, as I would like this for a chuppah and don't expect it will be used as a tallit to be worn after. I had been told that in a synagogue we must get married under a tallit, is this not the case? I was starting to think the groom is Sephardic, but I found out both the bride and groom are Ashkenazi. The bride sounds a bit fuzzy on the role of the tallit and the chuppah at the wedding, so I explained to her a bit about the various customs. The Sephardic custom is for the groom to put on a new tallit, and then a few minutes later, when the Sheva Brachos are recited, bachelors hold the tallit over the bride and groom. The traditional Ashkenazi custom is not to use a tallit at all, but today some couples adopt the Sephardic custom. However, among German Jews the tallit plays a dominant role during the chuppah ceremony. Not only is a tallit worn by the rabbi and two relatives honored with the recital of the Sheva Brachos, but a "chuppah tallis" is also worn by the chassan. The tallit is then draped over both the groom and the bride, and remains on them until the conclusion of the chuppah ceremony. The tallit is only removed from their heads after the cup of wine is drunk. 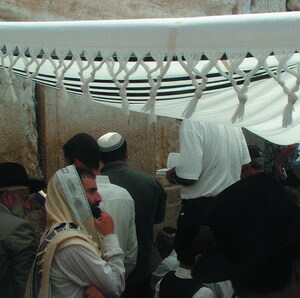 The chuppah is essentially a canopy that need not resemble a tallit. To understand a bit about the chuppah, refer to this page, and be sure to see the video. Some couples opt to use a tallit as a chuppah. We sell a unique "Chuppah Tallit" based on this interest. Even among those who do not have a tallit at the chuppah at all, we get a lot of brides (or their parents) who buy a tallit for the groom as a gift before the wedding. This custom came about because the predominant Ashkenazi custom is that young men do not start wearing a tallit at bar mitzvah, but only after they get married.